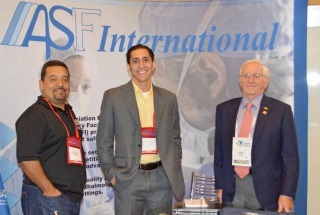 AAAASF International representative Oscar Molina (left), AAAASF Director of Accreditation Tom Terranova, MA, (center) and AAAASFI President Dr. Ronald Iverson attended the International Society of Aesthetic Plastic Surgery 22nd Congress in Rio de Janeiro, Brazil. 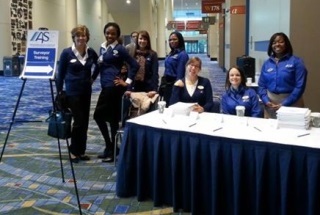 AAAASF staff members recently facilitated a successful AAAASF Surveyor Training Workshop that was held in conjunction with the American Society of Plastic Surgeons annual meeting in Chicago. The American Association for Accreditation of Ambulatory Surgery Facilities has created a LinkedIn page to help share AAAASF news, generate discussion and bring together members from all points of the globe. Follow the LinkedIn page today! Exercising, eating a healthy diet and learning relaxation techniques before colorectal cancer surgery appear to speed a patient's recovery, according to a small study published in the November issue of Anesthesiology. Smartphones and tablets are already widespread in the OR, but experts say there are more ways to use them than just as modern-day beepers. We asked around and found the coolest ways to use mobile devices in your facility. A poet might say that each human being's heart is a unique mystery. Those working in the brand-new field of computational medicine, however, can now model each of those unique hearts with marvelous accuracy and reveal their secrets. Split-dosing is the standard of care in colonoscopy bowel prepping, according to new multi-society guidelines, which also raise expectations for ensuring that patients present for screenings with adequate preps in place. Aiming to contain health care costs, a growing number of employers and insurers are adopting a strategy that limits how much they'll pay for certain medical services such as knee replacements, lab tests and complex imaging. The official purpose of a recent FDA-sponsored workshop was "to provide a forum for FDA, medical device manufacturers, additive manufacturing companies and academia to discuss technical challenges and solutions of 3-D printing." Simply put, the FDA is trying to stay current with advanced manufacturing technologies that are revolutionizing patient care and, in some cases, democratizing its availability. A new initiative announced by the U.S. Centers for Medicare and Medicaid Services will offer $850 million in funding to provider networks, professional associations and other organizations that are providing education and training in the transition to value-based healthcare. If you're good with a scalpel and willing to move, Kansas could be the place for you. Surgeons in the Sunflower State make more — when adjusting for cost of living — than anywhere else in the country: $277,820. Telemedicine has been utilized for over 40 years as a means of expanding real time care to patients as an alternative to face-to-face medical visits, but technological improvements to telecommunications have opened the doors for new forms of virtual clinical practice. Resolutions passed at the American Academy of Family Physicians Congress of Delegates aim to fix some of the most vexing barriers family physicians confront in providing care to their patients, including prior authorization, electronic health record incompatibility and lack of reimbursement for hospital consulting. Walking 6,000 steps or more each day might protect adults at risk of knee osteoarthritis from developing mobility issues, such as difficulty getting up from a chair and climbing stairs, according to a new study. A randomized controlled trial published in Psychotherapy and Psychosomatics indicates effects of a meditation technique, Tai Chi, on the inflammatory system. It is an exciting time in neurorehabilitation for physical therapists. Currently, scientists and clinicians are gaining knowledge on ways motor learning can impact patient care and their outcomes. The International Society of Aesthetic Plastic Surgery has issued a warning to all individuals seeking less expensive cosmetic surgical procedures, particularly outside their home country, and especially in the hands of unlicensed practitioners operating without board certification. In light of two recent deaths of U.K. citizens who traveled to other countries to have cosmetic procedures performed by un-certified practitioners, ISAPS is also calling for global changes in legislation to address these unnecessary and tragic deaths in an effort to ensure a higher level of patient safety. Medical tourism and plastic surgery: Is it safe? An ABC News report posted Oct. 23 describes the ongoing efforts being made by Dubai to turn itself into the number one medical tourism destination in the world. Dr. Simon Ourian of Epione Beverly Hills comments on the report and adds his views on the safety of medical tourism. A new report is claiming the Thailand medical tourism industry has been growing as a result of the quality hospitals in Thailand that are staffed by qualified doctors and state-of-the-art infrastructure.